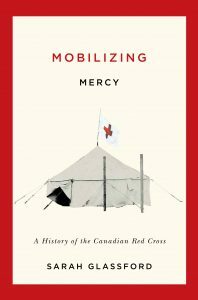 The following excerpt from Sarah Glassford, Mobilizing Mercy: A History of the Canadian Red Cross (Montreal & Kingston: McGill-Queen’s University Press, 2017) is reproduced with the permission of McGill-Queen’s University Press. During the First World War, the Canadian Red Cross Society (CRCS) mobilized Canadians across the country in support of its humanitarian work for the benefit of sick, wounded, and captured Canadian, British, and allied servicemen. The hospitals, ambulances, sewn and knitted comforts, information bureau, POW food parcels, hospital visitors, and supplementary hospital supplies provided by the CRCS overseas relied on the voluntary labour and financial contributions of millions of Canadians at home (explored by Rebecca Beauseart here). As the CRCS learned, it was no easy task to maintain this level of support over four long years, and persistent, damaging rumours and reports that donated comforts were being sold to soldiers (the sort of thing that would circulate as “fake news” on social media today) certainly did not help. The positive overseas results of the [Canadian Red Cross] society’s homefront work did not mean its war effort was free of challenges. Despite attempts to regulate women’s work through a combination of patriotic appeals and scientific management, women retained ultimate control over their voluntary labour. National Headquarters intermittently received word of poorly attended meetings, a general lack of enthusiasm, or women who would not “settle down to work.” crcs officials chastised women for failing their men and their country, while local branches strove to revive enthusiasm through efforts such as deliberately combining sewing and socializing into one evening program. Some volunteers responded to these tactics, but the fact remained that labour voluntarily given could always be voluntarily withdrawn. The relative invisibility of the society’s overseas work, to those in Canada, produced another serious problem: recurrent rumours of sock-selling from 1915 onward. Canadians naturally wondered if the comforts they sent actually reached soldiers, and in a context where war profiteering was considered an unforgivable crime, the ubiquitous socks took on a new symbolic importance. The possibility that gifts freely given by Canadians might be sold to soldiers for someone’s profit angered Canadians, as did an accompanying rumour that Red Cross supplies sat in warehouses unused, while soldiers went without (a rumour that, as Margot Duley shows, similarly plagued the Women’s Patriotic Association of Newfoundland). A separate rumour insinuated that provincial and national crcs officials were paid large salaries at the expense of aid to soldiers. Sociologist Ari Adut points out that scandal can be exacerbated when the perceived transgressor has high status, and also when the scandal appears to demonstrate “a deficiency of internal control within the transgressor’s group.” Both the society’s place as a leading Canadian war charity and the accusations of moral laxity among some crcs workers, therefore, served to increase the impact of the rumours. In the pages of [its national newsletter] Bulletin and newspapers across the country, the society attempted to combat these rumours by refuting their charges and explaining the actual situation: the crcs did not sell socks, hospitals had only to request supplies in order to receive them, and with the exception of the overseas commissioners and a handful of bookkeepers and stenographers, the society’s many officers paid their own expenses and provided their services free of charge. [CRCS Overseas Commissioner] Colonel Hodgetts was asked to investigate the operations of the crcs depots overseas, just in case, but discovered none of the rumoured problems. [Bulletin editor] Mrs Plumptre’s attempts to trace those who had bought Red Cross socks turned up an endless chain of hearsay and no identifiable purchasers. In 1916 Alberta branch president R.B. Bennett attributed the “slanders and words of mistrust” to enemy attempts to undermine Canada’s war effort; in 1919 journalist Mary Macleod Moore similarly called the persistent rumours “a ‘Made in Germany’ story.” The rumours never completely died, but seem to have peaked in 1916 – the same year crcs leaders observed a decline in supplies received – and slowly declined thereafter. The rumours may have constituted a form of backlash against the ubiquity of the Red Cross in wartime Canada. They may also have sprung from confusion overseas: so many organizations provided comforts – including a variety of national Red Cross societies – with different policies attached, and so many comforts and supplies changed hands in so many places that it was probably difficult to distinguish who was doing what. Marc Bloch writes that “false news is probably born of imprecise individual observations or imperfect eyewitness accounts,” at which point “the error propagates itself, grows, and ultimately survives only on one condition – that it finds a favorable cultural broth in the society where it is spreading.” No doubt someone, somewhere, did sell socks: perhaps unscrupulous Red Cross volunteers, black marketeers, or soldiers. Back in Canada, the rumours themselves – these magnified misperceptions – were the problem. Ultimately, the long duration of the war had the greatest impact on the donations and labour Canadians gave to the Red Cross. Financial contributions remained high throughout and women produced comforts and supplies in abundance. Yet the war took its toll. By 1917 permanently maimed and disabled soldiers were returning to Canada in large numbers, presumably leading some women to channel their energies away from volunteering and toward caring for their loved ones at home. At the same time the increased demand for women in paid labour likely also removed some women from the voluntary sector. Income tax, inflation, and Victory Loan campaigns ate into Canadians’ disposable incomes. War weariness and charitable fatigue sapped citizens’ enthusiasm and energy. crcs documents do not allude to it, but the same labour shortages that prompted the federal government to introduce military conscription in 1917 surely had some impact on the voluntary workforce as well: there simply were not enough Canadians to do all the jobs that needed doing in a country embroiled in a bloody, industrialized “total war.” The combination of all these factors meant that women’s [comfort and hospital supply] production flagged noticeably, and cash contributions flowed less freely. H.B. Dawley of Courtney, British Columbia wearily observed in 1916 that “a person is called on two or three times every week to give some money to one of these funds and then they have all kinds of red cross entertainments or something of that kind.” And although seeing the physical results of modern warfare in returning soldiers might lead some Canadians to redouble their efforts for the Red Cross, it might just as easily convince others of the futility of jam and balaclavas in the face of machine guns and mustard gas. Dr. Sarah Glassford is a Canadian historian particularly interested in voluntary work, humanitarianism, and the experiences of women and children in wartime. She has been a co-editor of the Canada’s First World War series on ActiveHistory.ca since its inception.